Happy Tuesday, Friends! We are just days away from the first day of spring, and already the slightly warmer weather is thrilling. I can’t wait to go outside without wearing a coat, take long walks, and reading in the park. Hopefully, I’ll be reading at least a few of the books on this TBR list. Let me know what books you’ll be reading this spring in the comments! Thanks to The Broke and the Bookish for hosting this weekly book meme and happy almost-spring everyone! 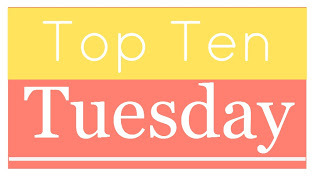 This entry was posted in top ten tuesday and tagged books, tbr, tbr list, Top Ten Tuesday by Alison Doherty. Bookmark the permalink. AHH, THE HEIR. I am so freaking excited for that book and I loooveee the series. I need to read THE WINNER’S CURSE too–most reviews are raving! I’m right there with you on both of these books. Can’t wait for THE HEIR especially since I loved that series! I HIGHLY recommend the Winner’s Curse! I just finished it today and it was FANTASTIC! Oh yay! That is so good to hear! I put it on hold at the library so hopefully I will get to it soon! I need to read the winners curse Ive seen good things about it. Me too. It feels like everyone is talking about it! I want to read all of those!! Especially the Heir, I’m so annoyed I forgot to add that. I’ve read Before I Fall, and adored it 🙂 Hope you enjoy them all! Thank you! I can’t wait until I start working through this list! I need to read Red Queen. I’m hopefully going to get around to it soon. I can’t wait for Emery Lord’s new book too! 😀 I hope you get to read these books. Hope you read them too. I’ve been hearing such good things lately about Red Queen. It’s not what I usually gravitate towards, but I’m very intrigued. I really enjoyed Red Queen — great dystopia/fantasy mix with a killer plot twist! I just got out The Winner’s Curse from my library so I’ll be reading that soon, I hope! Oooh, you reminded me about The Heir! I have a love/hate relationship with The Selection series, but the books are so addicting, if super frustrating, haha. And I haven’t yet read anything by Neal Shusterman, but I’ve been seeing Challenger Deep floating around lately and I’m interested. Great list! I have a bit of a love/hate relationship with THE SELECTION too, although I usually try to focus on the love part. You should definitely pick up UNWIND by Neal Shusterman … it is one of the most intelligent YA books I’ve ever read. Couldn’t recommend it more. The Winner’s Curse is fantastic – don’t read too much about it, just pick it up. I keep hearing mixed things about Red Queen, but I picked it up recently so I’m hoping to enjoy it. Curious to see what you think of it. Thanks for the tip about Winner’s Curse. Hoping to read it in the next week or two. I completely forgot about The Heir! I’m hoping for so much out of it…and it’ll be interesting to see America and Maxim as King and Queen, not two teenagers. Love your list! The Heir is definitely top of my list as well! And Winner’s Curse, and Red Queen. Great list!